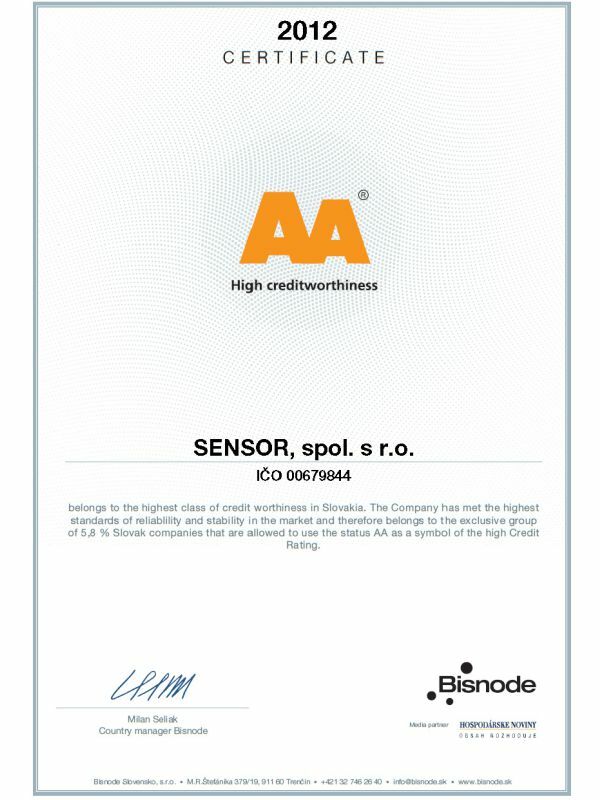 Sensor has been awarded AA certificate of creditworthiness ! Sensor is proud to announce that it has been awarded another certificate. This time its certificate of creditworthiness by Bisnode s.r.o. Only 5,8% of all Slovak companies are allowed to use the status AA as a symbol of the high credit rating. Our company has met the highest standards of reliability and stability in the international markets. https://www.sensorgroup.com/wp-content/uploads/bisnode.jpg 800 600 Slavo Spes /wp-content/uploads/x-sensor-group-logo-1.png Slavo Spes2012-10-22 09:34:432019-02-28 12:34:03Sensor has been awarded AA certificate of creditworthiness !